The Lunar Series II program from the Perth Mint isn’t just one of the most coveted in the world, it is also one of the most diverse precious metal programs available today. With gold and silver coins in bullion and proof versions, there are few options with more variety for investors and collectors right now. 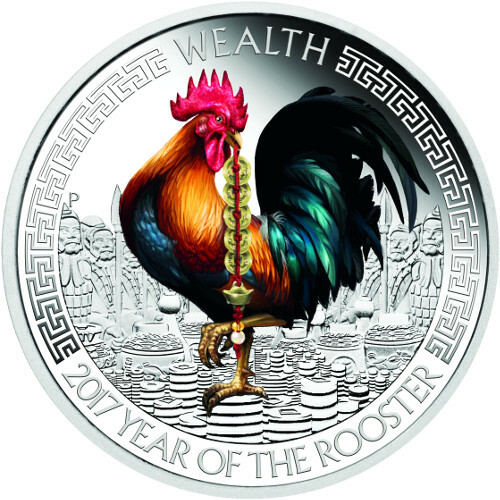 Right now, the 2017 2 oz Proof Silver Australian Rooster Wealth and Wisdom Two-Coin Set is available to purchase online at Silver.com. Ships to you in a Perth Mint two-coin case with themed packaging. Mintage limited to 1,500 coins only! Consists of a total of Two Troy ounces of .9999 fine silver in colorized proof. Bears individual face values of 1 Dollar on each coin backed by the government of Tuvalu. Obverse of each includes the Queen Elizabeth II effigy. Reverse includes Wisdom and Wealth colorized images. 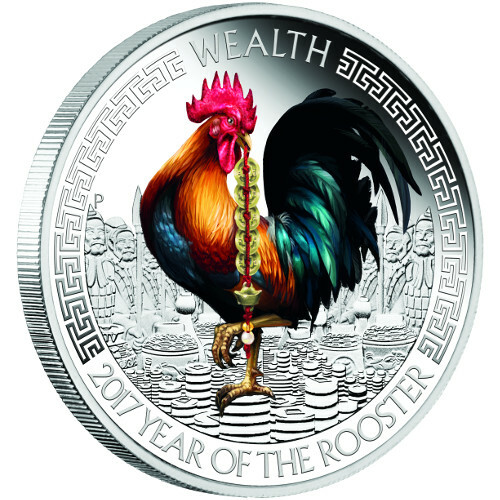 Each 2017 2 oz Proof Silver Australian Rooster Wealth and Wisdom Two-Coin set in this listing ships to you inside the Perth Mint’s standard black display case, with a two-coin black velvet slot inside. 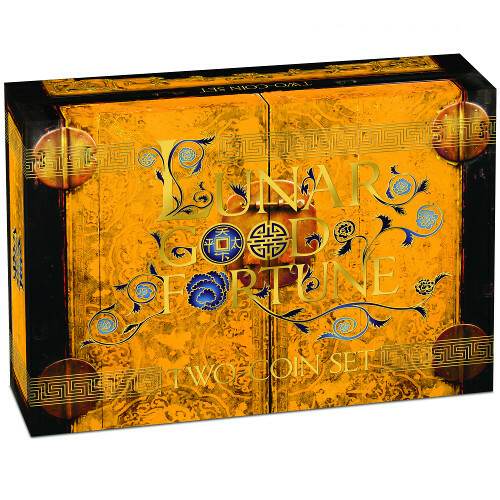 The box ships inside of a presentation package with Year of the Rooster designs, and includes a numbered Certificate of Authenticity. The Year of the Rooster covers all those born in 2017 and every 12th year going backward in time. The 12-year cycle of the Zodiac assigns a different animal to each of the 12 years, with those born under the sign of a specific creature said to share the emotional and character traits of that creature. Perth Mint’s Lunar Series II coin program features new releases of the Chinese Lunar Calendar animals compared to its original series. 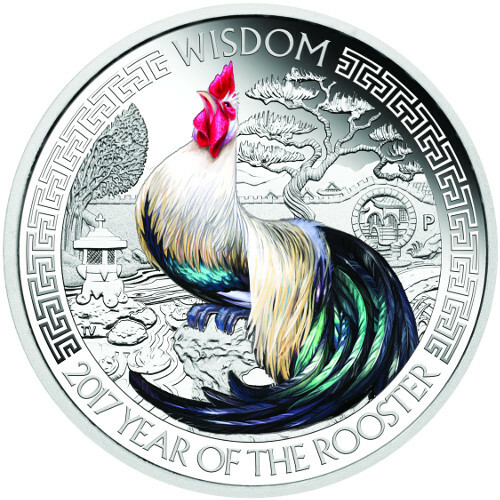 Each new coin release features the animal for the given calendar year, with 2017 representing the Year of the Rooster. Those born under the sign of the rooster are said to be honest, loyal, sociable, and hardworking. 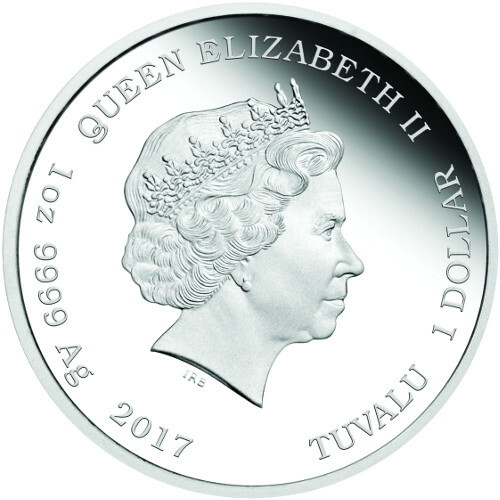 On the obverse of the 2017 Wealth and Wisdom coins you’ll find the right-profile portrait of Queen Elizabeth II. Created in 1998 by Ian Rank-Broadley, this design represents the fourth-generation depiction of the Queen since she ascended to the throne in 1952. The reverse of the 2017 1 oz Silver Australian Rooster Wisdom coin also features a colorized image of the rooster, this time with softer colors and hues of deep blue, green, and black on its very long tail feathers. It represents age and wisdom, with an aged rooster standing in a Chinese water garden atop a scholar’s rock. If you have any questions, please feel free to contact Silver.com. Our customer service associates are available at 888-989-7223, online using our live chat, and via our email address. 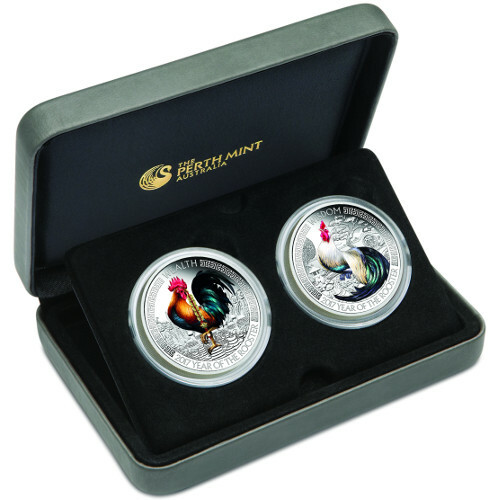 If you’re looking to buy silver, this Silver Australian Rooster Two-Coin set is an excellent option!